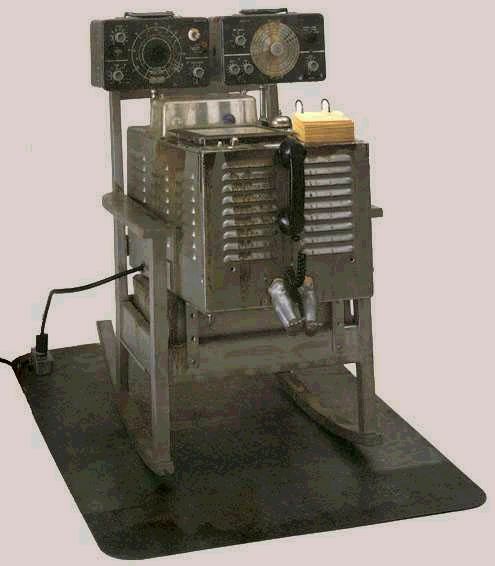 Included in the exhibition, The Machine as Seen at the End of the Mechanical Age, curated by Pontus Hultén at the Museum of Modern Art, New York, 1968. Aluminum painted rocking chair, metal case, instrument boxes with dials, plastic case containing yellow and blue lights, panel with numbers, bell, "rocker switch", pack of index cards, directions for operation, light switch, telephone receiver, motor, and doll's legs, 40 x 39 1/8 x 24 1/2" (101.3 x 99.2 x 62.1 cm), on aluminum sheet 48 1/8 x 36" (122 x 91.5 cm). "Love, Hate & the Machine," Time Magazine (review of The Machine exhibition), 1968. Link in AEM Companion.